As the children grow, I want to make sure that we have lots of opportunities to spend quality family time together. Sundays are our family day. We always plan an activity – a walk or visit to one of our favourite National Trust Sites, like Croome. I am also very keen that we eat meals together as a family. This is not always possible during the week, due to work and nursery schedules, but on the weekends we have a few special meals, like a family Sunday breakfast. 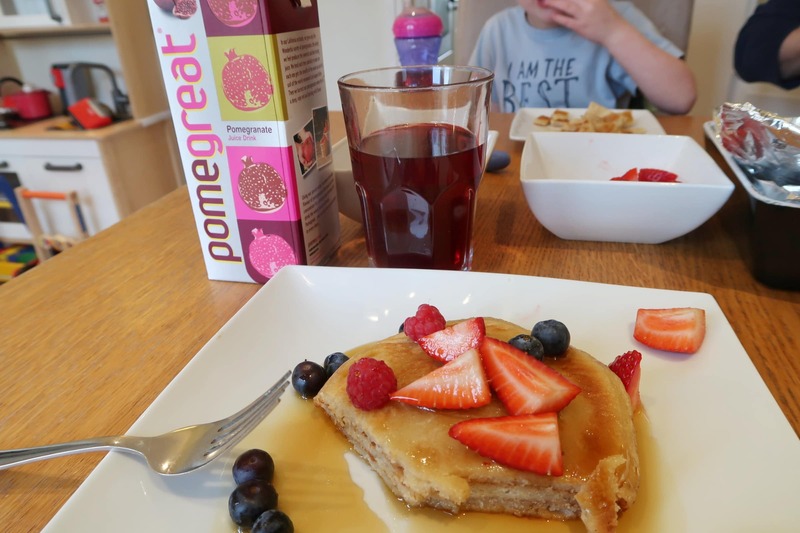 Pomegreat asked us to add their delicious pomegranate juice to our Sunday breakfast routine and they kindly sent us some sample juice to try. 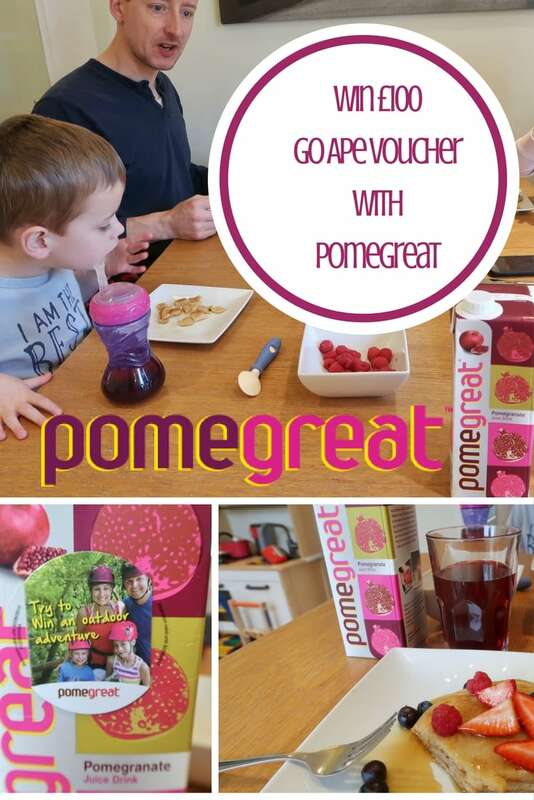 In addition, Pomegreat are offering families the chance to spend some quality time together on a Go Ape treetop adventure – see the Rafflecopter at the end of this post to be in with a chance of winning the experience for your family. Our family breakfast this Sunday consisted of fruit, daddy’s pancakes and Pomegreat juice. We are very lucky that daddy is a great chef and makes the best pancakes. I must admit, I am a little wary of giving the children too much fruit juice. Although it is packed with goodness, juice also tends to be quite high in sugar. This means they generally only have it once or twice a week, so it fits in perfectly with our Sunday breakfasts. I had never tried Pomegranate juice before and I was very pleasantly surprised. It was crisp and tasty without being too sharp or too sweet. The children also enjoyed a cup each over breakfast. I think Pomegreat would be a great addition to our weekend meals. Go Ape have outdoor adventure centres all over the country which run Tree Top Adventures, Forest Segways, Tree Top Junior Adventures and Zip Trekking Adventures. They are the UK’s number one forest adventure and can be found in 31 of the UK’s most breathtaking locations. Days out at Go Ape are about living life more adventurously, having fun, spending time with family and friends. Biggest and Littlest are just a bit too small to take part in a Go Ape adventure yet – but I hope it is something we might be able to do in the future. If you want the chance of winning an exhilarating outdoor adventure with your family, there are several ways to enter. Firstly, we are offering a £100 voucher for one reader – simply enter via the Rafflecopter below. 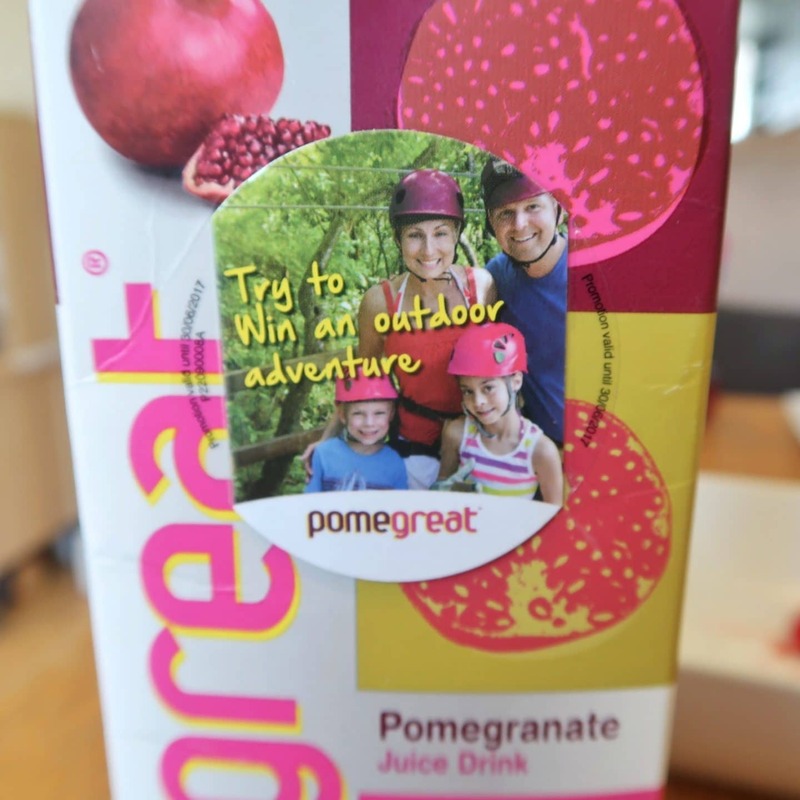 In addition, each carton of Pomegreat comes with another chance to win. Simply pick up some Pomegreat and follow the instructions on packs to be in with another chance of winning. Please note, terms and conditions apply. Please see the terms and conditions on the Rafflecopter, and on packs, for more details. Please note, this was a collaborative post. Pomegreat kindly sent us some juice to try as part of our family breakfast. Love your videos! You’re doing a great. Ideal family breakfast would be cereal and crossaints! A toasted muffin topped with a poached egg and homemade porridge! We’re big porridge fans and my teenager loves those terribly lazy instant porridge sachets but that’s fine with me if it encourages a bit of independence. i love porridge with blueberries and honey, never get bored of it! We like porridge. My Mum likes pomegranate as a fruit, so may treat her to some Pomegreat to try. We love bacon and egg sandwiches in this house! A full English followed by some fruit. Thanks for the lovely giveaway. Waffles and fruit makes everyone smile on a Sunday morning. I’ve not tried Pomegreat but will give it a go for sure. A full fry up, bacon, sausages, beans… my mouth is already watering! Waffles for everyone, and then bowls of toppings to choose from. I like banana, nutella and maple syrup. One that I don’t cook! We like to have Porridge with a piece of fruit. a full English, but by the time we all get up and dressed its normally brunch. My ideal family breakfast is a giant fry up! With all the trimmings. It doesn’t happen often so thats why its ideal! French toast with crispy bacon. We love pancakes, with fruit and maple syrup as a treat! I love a proper fry up on a Sunday morning. a good old fashion full breakfast – preferably at a cafe! Our favourite breakfast has to be pancakes! With golden syrup, lemon and nutella! I have 4 kiddywinkles so always make the pancakes in advance ans then warm them up in the oven ( think they go soggy in the microwave)! Fresh cheese and ham with lots of croissants and fresh butter! I do love a full English breakfast with black pudding. Not overly healthy but lovely. Banana on toast, we all love it. Cereal and fruit for us – raspberries, blueberries and strawberries are the favourite! Soft Boiled Eggs! with Toasted Soldiers. We love pancakes with bacon and maple syrup, with some fruit on the side! We love rolls on bacon with sautéed onions and mushrooms! I think we would all eat pancakes every day if we had the time! My ideal family breakfast is porridge with fresh fruit, followed by poached egg on toast. Brioche and pastries, its a real treat. My ideal family breakfast is an included breakfast in a hotel somewhere where the kids can go up to the buffet and choose wha they want. They feel very grown up. Croissants followed by Greek Yogurt and Honey is my favourite family breakfast but mostly I just eat fresh fruit in the morning. Pancakes with fresh fruit a plenty! Smoked salmon scrambled eggs on toasted cheese bread. Yummy! Anything that somebody else makes! 🙂 I love poached eggs and fresh croissants. Mushrooms on brioche toast – preferably made by someone else! long slow leisurely breakfast with lots of fresh fruit and fresh hot pastries! bliss! Scrambled tofu and mushroom on crumpets. With cranberry juice. Home made muffins and orange juice sat together and having a nice chat. Eggs Benedict fresh orange juice and a mug of tea. A fry up with the full works! My ideal family breakfast is a full English at the weekend. Ohhhhhh poached egg on toast with lots of brown sauce!! Porridge is my ideal family breakfast. It’s cheap and nourishing. One where we actually eat together and not ram things in our mouths as we go out the door!! A quiet one but with three girls arguing it’s not happened for the past 14 years lol. I just grab whatever cereal we have to be honest and that’s if and when I get chance to. 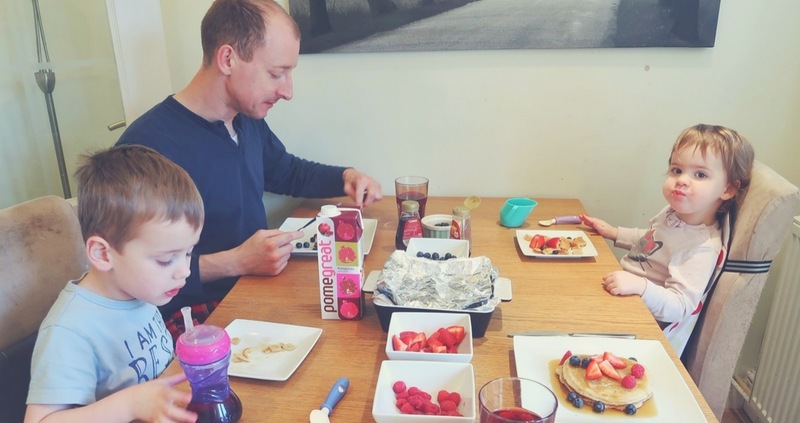 Our ideal family breakfast is sitting together around our kitchen table, enjoying a breakfast of freshly made pancakes with a variety of toppings, danish pastries and lots of orange juice! All our family love our cereal so tend to have several different varieties handy to keep both old and young happy and chopped up fruit (fresh and dried) always goes down a treat. A fry up with absolutely everything! Anything as long as we are all together, that’s the most important thing. This would be fab! A great gift!